Honda’s Civic IMA hybrid has been on sale since 2006 but we’ve only just summoned up the enthusiasm to try one. Honda last week put out a press release saying sales are on the up - it sold just 526 examples in the UK in its first year, 2,800 last year, and sales rates are increasing - so we thought we'd see what these buyers were getting. No doubt more would be sold if the IMA were better suited to its market. Like us, Honda UK reportedly wanted to see the hybrid mechanicals installed in the Euro-spec Civic hatchback bodyshell – the one with the pointy glassed-in nose, rocket-ship door handles and double-decker rear screen that has been selling rather well. 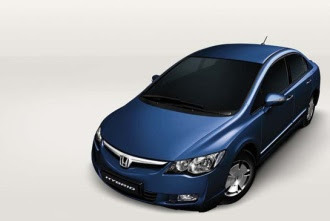 Instead the European market has been fobbed off with the three-box Civic as seen, with minor snout surgery, in Japan, America, China and this year in India. It’s a production issue, apparently. All the world’s Civic hybrids are built in Sazuka, whereas Europe’s hatches are built in Swindon. Suffice to say the IMA is not exactly perfectly matched to British buyers’ or our tastes. If we wanted a small, ungainly saloon we’d buy a BMW 3-Series. So we found ourselves sitting in 2008-spec Civic hybrid. Behind the wheel you can’t see the unexciting exterior, or the smallish boot. Instead you are faced with a large expanse of plastic dashboard and controls that seem to have been arranged not so much ergonomically as haphazardly. We only had the Civic for a couple of days and never quite worked out what was where. Quality feel, for your £17,000 plus, is a bit lacking. The oddment bins are like Tupperware, the switches are all a bit Dixons. We liked the high-level digital speedometer, low-level tacho and minor instruments. Whereas the Toyota Prius makes quite a visual song and dance of telling the driver where the energy is going, via a big centre screen, the Honda makes do with a simple charge/assist gauge next to the rev counter. Neat, effective and not distracting. You’ll watch it for a while and then ignore it, which is as it should be. Get going and the IMA feels like a normal, petrol-engined automatic with a continuously variable transmission. Plant your go-faster foot and the engine will sound like a vacuum cleaner – revs kept high for maximum power while the wheels catch up. The little gauge will tell you that the batteries are dutifully assisting by calling up all the electric motor’s torque. And, if you don’t mind the noise, you’ll find you are accelerating at quite a rate. Brake or slow down and the motor will switch to generator mode, topping the batteries up again. In our two days’ motoring we lost track of the number of charge/discharge cycles. Suffice to say the IMA’s Ni-MH batteries work hard for a living. Slow to a stop and the petrol engine will switch off completely – part of a package of economy-boosting tricks that include shutting down fuel supply to the cylinders and closing the valves on the overrun. Closing the valves seems odd – it wastes energy repeatedly compressing (and thus heating) air trapped inside, but this apparently is less wasteful than pumping fresh air in and out of the cylinders. The Auto-Stop engine is never a bother – the hybrid motor acts as a starter and gets everything going again without perceptible hesitation. It’s a great pleasure to sit, in total silence (if you switch off the aircon) in traffic jams. Well, it’s never a pleasure to sit in a jam, but it’s markedly less frustrating if you feel at least you aren’t pumping money out of the exhaust pipe for the dubious privilege of being instantly ready to creep forward half a car-length every ten minutes. The motor only stays dead while you have your foot on the brake, however, which can be a pain when stop-start traffic is more stop than start. Releasing the brake is what triggers the engine to fire again – this gives the engine a moment in which to light up while your foot makes its way to the accelerator – so we’re not sure what trigger Honda could use to create a better system. We measured about 50mpg at the pump – better than we expected but obviously not as good as the official frugality figures. It sits in Group 7 as far as car insurance is concerned - the same as the Toyota Prius - which also helps to keep costs under control. Overall, we really liked the Civic IMA. It’s rewarding to drive, combines economy, refinement and performance in a persuasive manner, and is let down only by a slightly below-par interior. We’ll even forgive it that awkward boot.